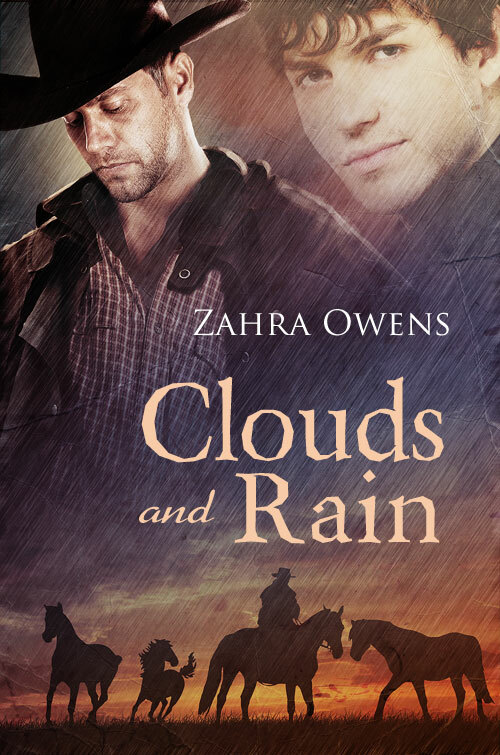 When Clouds and Rain was voted book of the week at Whipped Cream Reviews I received this book video. Clouds and Rain has its share of tearjerkers and Ms. Owens wrote those well. Each man shows his emotion, but none feels forced or wimpy. They’re just strong men who go through some major hurdles in order to get to their happily ever after. Clouds and Rain is available in Italian! Look for the Spanish version from May 22nd! Flynn Tomlinson ha ido a la deriva durante los últimos años, aceptando todo tipo de empleos cuando necesitaba dinero y marchándose a otro lugar en cuanto lo obtenía. Está contento con su estilo de vida sin tener que echar raíces ni ser responsable de nada más que de sí mismo. Un día encuentra un cartel que reza “se necesita ayuda” en una oficina de correos de Idaho, y conoce a Gable Sutton, que no puede trabajar solo en el rancho porque un serio accidente lo ha dejado impedido. Como su sueño es volver a trabajar con caballos acepta los términos del contrato que Gable le ofrece. Sin embargo, lo que no negoció fue enamorarse de ese hombre amable y solitario, que capturará su corazón y hará que tome sobre sus hombros una carga increíble: salvar su rancho. I hope the other two are to your liking as well. Thank you very much for this thoughtful and insightful review! I spent the last two days reading (in french version unfortunately, I prefer the original words when I can read the language) this really nice book. And most of all, I appreciated the reality and the complexity of the characters and the situations. I think I prefered Gage because of his harshness, his silence and his will. But Flynn was really funny and adorable too. I mus confess I really can’t bear Grant, even after of the explanations on him, I think I just find him unsympathetic. However, I am very curious about Hunter and his ranch. Could be great reading the story of his youth or his relationship with Grant or the discover or the acceptance of his homosexuality. Thank you for your lovely comment. As you can tell, Gable and Flynn are very dear to my heart. I hope that when you get to read Earth and Sky you’ll find some love for Grant too. He’s not a bad person, but he was between a rock and a hard place and he made some bad decisions in Gable’s eyes. I suppose if you don’t like him after Clouds and Rain, I did my job 😉 but I hope the next book will let you see there are two sides to every story. Thank you for taking the time to let me know you enjoyed the book.